Norwegian Broadcasting (NRK) made television history with its record-breaking “minute-by-minute” coverage of a coastal voyage on a Hurtigruten vessel two summers ago. 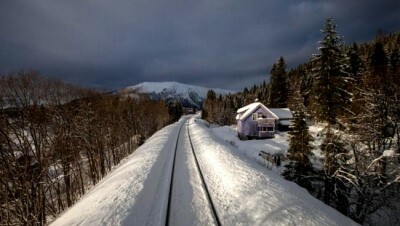 It’s since made similar “slow TV” shows, and the latest coverage of a trip on Norway’s northernmost train line was another big hit over the holidays. More than a million Norwegians, or roughly 20 percent of the country’s entire population, sat down in front of their TVs late last week and watched the views from Nordlandsbanen, the train line that runs over 729 kilometers (438 miles) from Trondheim to Bodø. Those who created the show for NRK were mighty pleased by the high ratings. “It was a fantastic trip,” said Rune Møklebust of NRK Hordaland, who was among those initiating the Hurtigruten show in 2011. The new program featuring the ride on Nordlandsbanen was different in that it was taped and edited, allowing NRK to show the train line in all four seasons, instead of just one trip in one season. “It was a major editing job,” Møklebust said. “Four tapings had to be coordinated and all the transitions had to be adjusted.” Viewers could then roll along the entire train route departing from Trondheim, seeing all four seasons in “just” one sitting of around 10 hours. Some call Nordlandsbanen Norway’s most beautiful train route as it winds through mountains, over plateaus, crosses 295 bridges and goes through 154 tunnels. It also crosses the Arctic Circle along the way. State railway NSB seemed delighted to accommodate NRK’s crews and cameras: “It’s great to be able to show off Nordlandsbanen in this way together with NRK,” said Tom Ingulstad, in charge of NSB’s passenger trains. NRK’s “minute-by-minute” travel programs have been wildly popular, starting with its first coverage of a trip along Bergensbanen, the train line running over the mountains between Bergen and Oslo. Viewers, even those who had routinely traveled the route themselves for years, watched for hours on end, not wanting to miss any portions of the journey and finding the documentary oddly relaxing. They also stayed up all night in June 2011 to follow along on the five-day Hurtigruten voyage. The train line connecting Bodø with Trondheim and points in between is among Norway’s newer lines, completed in 1962. It has a long and brutal history behind it, though, from the time the idea was launched for the line in 1862 until work began in 1881. Hard times and difficult conditions halted construction, though, and work didn’t resume until Hitler’s Nazi forces invaded Norway and Hitler ordered the line to be built after he had attacked the Soviet Union. The train line then became known as “krigsbane” (a war line), according to Bjørn Tore Hansen of NSB. Around 25,000 prisoners of war were forced to work on its construction, and many of them died in the process, giving the line another name: Blodbanen (literally, “the bloody line”). The late King Olav V officially opened the completed Nordlandsbanen 50 years ago, another reason for NRK’s decision to feature the line on a “minute-by-minute” program with occasional music augmenting the scenery. Plans to extend the line north of Bodø were put on ice in the early 1990s but there’s plenty of scenery along the route as it is, from farmland and forests in Trøndelag, to the high mountains of Saltfjellet, to the fjord and coastal areas from Rognan to Bodø. The line can also offer the Midnight Sun in the summertime and Northern Lights in the wintertime. For a taste of the show itself, click to NRK’s preview here (external link, in Norwegian) and then click on the arrow on the photo. For the entire journey, all 10 hours of it, try clicking to NRK’s special “Nordlandsbanen” page here.